In our last newsletter we announced a new Time Cards report, which conveniently consolidates an employee's daily punches to one line per day. We received a lot of positive feedback from you that this new report makes it easier to process your payroll. 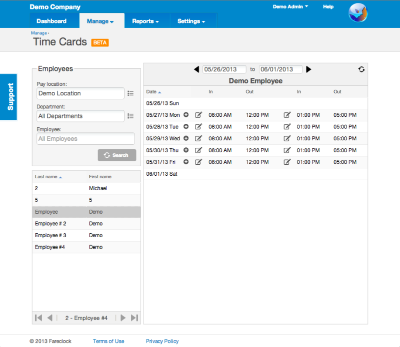 In a similar vein, today we are announcing a new Time Cards editor. This new editor enables an intuitive and stream-lined method to viewing and editing employees times quickly. It removes much of the extra effort and distraction at having to open each punch to edit or to add punch times. At the same time, you can still access the complete punch detail from the editor. Below is a screenshot. We are currently labeling it as a "Beta" feature, to emphasize to you that we'd love to hear your feedback on it. We are definitely planning to do more with this editor and make it even more useful to you. So let us know what you think! RESTful API for customers who want to build custom software applications which interface with Fareclock services and data. Additional payroll exports including job costing data to Quickbooks, and Valiant software for restaurant and food service operators. Employee auto-complete search, so you can quickly get to the employee you want, without having to scroll through employee lists. You can now permanently delete punches and delete employees, in addition to being able to reject/deactivate them. If you'd like to stay abreast of our new features as they release, you should definitely follow us on Twitter or Facebook, where we post more frequent, bite-sized announcements. Lastly, please keep sending us feedback: what you like, what you don't like, what new features you'd like to see from us. We highly value your input, and it is the primary driver of where we focus our time, money and efforts.